If my math is correct, this is the 53rd race report since we started Run for Dom in 2010. 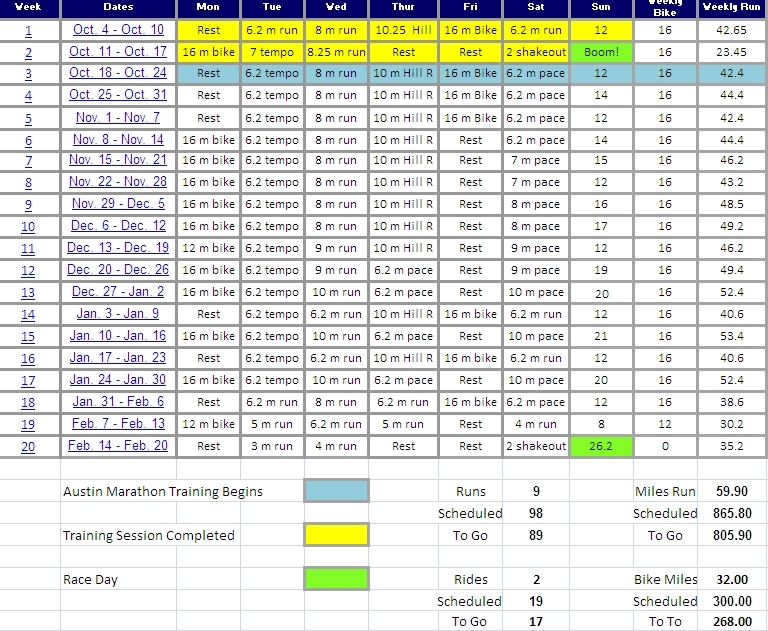 53 competitive road races and triathlons in a little more than 3 years. That is a whole lot of racin’. The funny thing is, I can remember just about all of them. The weather, the courses, all of the PR’s and especially the races where things didn’t necessarily go my way. There were two races out of all of them where I was not entirely “whole”. Where instead of feeling like I was primed for a big performance, I was managing some sort of injury or comeback. The first time was the Cooper River Bridge Run in 2011, the second time was Saturday morning. It made for interesting levels of nervousness prior to the events where instead of wondering what the race clock was going to say when I crossed the finish line – the victory was going to be in simply finishing the race injury free. In a bit of irony, the Texas Independence Day 5K was going to be my first real maximum effort workout since the Shiner Half Marathon in December. The race where my Achilles strain occurred and knocked me out of the Houston Marathon. It would also be my first step back toward our next “big” event which oddly enough is the very same Cooper River Bridge Run circa 2013. A race now just 5 weeks away, the third largest 10K in the country. Full circle it would appear two years later. Knowing I was not quite prepared to race to my potential, I decided to ignore my watch, run entirely by feel and not obsess about splits and pace. 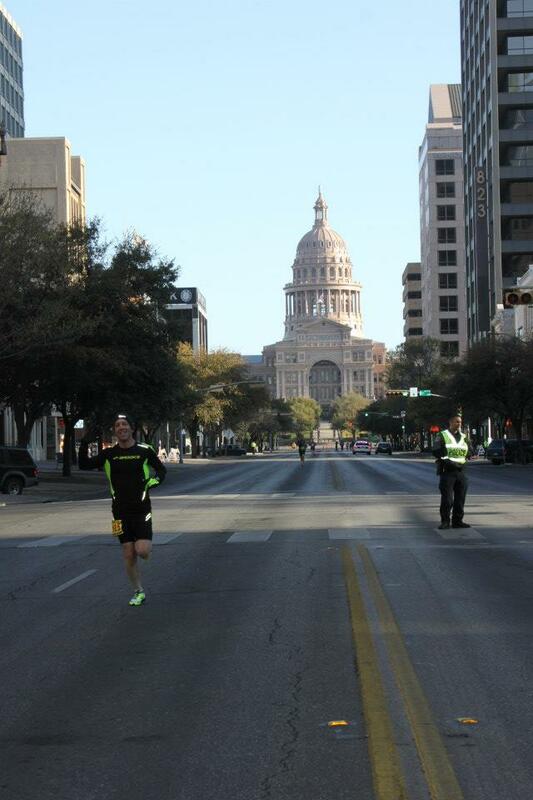 The course was unkind, starting at the south end of the Congress Avenue Bridge, starting on an incline and then heading straight uphill more than 125 feet to the Texas Capital. In addition to the ascent, the course was going straight into a headwind and then would be turning four consecutive 90 degree left turns before crossing back in front of the State House and cruising back down to the finish line. It was a pretty brutal circuit – especially for someone who had not done any speed work since two weeks before Christmas. Instead of thinking about taking a shot at our 5K PR of 18:02 and maybe breaking through that 18 minute barrier my goals were much more uncomplicated for the race. 2. Test yourself, but be aware of your limits. 3. Don’t do anything stupid out there. On Friday evening I received a message from a good friend in New England. We’ve known each other for a number of years now, he was there throughout Run for Dom, through the birth of my daughter, through multiple marathons for both of us – including some successes and failures. Of everyone who knows me through the sport of running, he perhaps knows me best – especially when it comes to my motivations, my desire to test myself and my desire to always run with honor when it comes to strapping on my race flats with Dom’s initials on the side. “As water reflects a man’s face so a man’s heart reflects the man.” – Proverbs 27:19. I wrote that on a small piece of paper and carried it with me to the start of the race on Saturday morning. It would be the last thing I would see before I fixed my gaze on Congress Avenue below my feet, bowed my head and waited for the muskets to fire and head out onto the course. The Start: I had sized up the field around me before the start. There were approximately 300 runners lining up, 10 or so had “the look” in their eyes. On another day I might have had enough talent to challenge each of them. On Saturday I thought my odds of running in the top 5 were pretty slim, but we were going to give it our best shot. Mile 1: With the blast of four guns we were speeding off to the capital, we bounced up the first incline on the bridge and my legs felt like they were hardly touching the ground. I had not run at this pace in more than two months – it felt exhilarating. The wind was blowing 15 mph straight into the runners and as we crossed the unprotected bridge it was pretty fierce. I was settling into fourth position and there was nobody to tuck behind except a young High School Runner who made me at 136.5 lbs. look like a linebacker. He could not have been much more than 115 lbs. dripping wet. We matched stride for stride for the opening 1/2 mile until I locked in to my even effort for the climb with him about :15 seconds in front of me. I heard footsteps behind me over the opening half-mile, but by the time we reached 6th street and started the steepest part of the climb it was silent. I was alone running in 4th place and unless I completely fell apart or another runner mounted a fierce change, that was where I was likely to stay. Not even one mile into the race and our spot was firmly established. It made forcing the issue even more pointless coming back from my Achilles strain and I thought about goal number 3 for the day. Don’t do anything stupid. We reached the end of mile 1 and at the beep I opened with a 6:10 first mile. If you take :15 seconds for the wind and the climb we were approximately at 5:55 pace where we are usually at 5:45 at the start of a 5K. :10 seconds off of our usual full-health fitness pace. About what I had been averaging during my training runs. Time to lock it in and stay even. Mile 2: The second mile started by climbing the last remaining stretch to 11th street and then battling up three consecutive hills around the capital. On the highest point of downtown Austin the wind was howling and the pace was difficult to maintain. I decided to bypass the water stop at the 1.55 mile mark and keep battling the elements. On the last left turn I looked back over my shoulder and the fifth place runner was not making a dent in our lead. I boxed the capital, made a right hand turn headed back toward the Congress Avenue Bridge and glanced down at my watch at the beep – 6:07. I was :07 off of our usual mid-mile split. Mile 3: At the start of mile 3 I thought about putting down the gas a bit to maintain our pace but decided instead to just stay even. I had a little bit more to give, but I wanted to be sure to keep our form and our stride uniform as we started the downhill section. I would pick up a bit of speed in this section without having to hammer away at the pavement. I was able to spot my co-worker Elise who snapped this photo along the route. I hit the bridge with a final full mile at 5:55 pace. Again about :10 off of where we might have been had we been on point, but a very respectable close to a solid race. We hit the finish line in 18:43, 4th place overall, first place in the Masters Division. Post Race: The Texas Independence Day 5K was just a small race on a big day in the state of Texas. By far my least favorite distance to race – it was the most fun I have had in a pair of running shoes in almost three months. The takeaway from the race was that I can stop feeling tentative, stop analyzing every step that I take, every stride on my runs and wonder if something is “wrong” with my left side. I’m back and while I can’t say I’m better than ever yet – I know it is just a matter of time. I have a great plan in place for the next few months as we ramp up for Charleston, SC on April 6 then transition to Triathlon season for the summer. By the time we return to the Kerrville Half-Ironman in September, we are going to be even more fit and more confident than we were one year ago. Sub 5 hours in Kerrville is imminently possible if we stay healthy and get some race day weather cooperation. From there it will be fall Marathon preparation for either a late winter race or perhaps a return trip to Houston where we finally get our chance to do battle on that storied course. But thinking about those things are akin to flipping to the final page of a book to find out how it is going to turn out before you start it. All in due time. All in due time. All I know right now is I have an appointment on Thursday morning with our hill for the first hill repeat session of 2013. Time to get this train rollin’. Great job Joe, and welcome back. Congrats on your AG win. I bet it felt great to test the wheels out there. 18:43 is a bada$$ time! Looking forward to seeing your progress this year. Thanks Jason! It felt great to be out there running hard and pain-free. Hopefully this was the final stop on the comeback trail. Legs feeling great post-race. I have an hour today on a treadmill for charity, then it is back to training! Well done Joe! A nice way to get back into it. That was a heck of a run. Thanks Trey! I didn’t think it would take until March to notch my first race of 2013, but I’ll take all the top 5’s I can get! Waait a second. I have a question. Didn’t you say you were going to ‘ignore your watch and just race by feel?’ 🙂 Then how’d you know those mile splits?? 🙂 Nice work out there. Sounds like you lost very little in the big scheme of it; a lesson we all need every so often. Congrats on a great 5k. Love the 5k’s! They make you so strong. Ha! Busted Kelly. Actually I just “glanced down” a couple of times 🙂 Thanks for the note and the reminder that we do indeed need to hit the reset button every now and again, and it won’t be the end of the world if we take a little bit of a break here and there. Continued success this season Kelly. I think you are going to really have a special year. Hope the family is great!